PHILADELPHIA, PA, December 31, 2018 /24-7PressRelease/ — BeenThere, the leading advice network for business school admissions, released its survey of 300 current and recent MBA students at top programs. The study indicates how students define the unique characteristics of their programs across personality, environmental, academic and other qualities. This inaugural report features the M7, a historical consortium of leading MBA programs that includes Harvard Business School, Stanford Graduate School of Business, the Wharton School at the University of Pennsylvania, the University of Chicago’s Booth School of Business, Columbia Business School, MIT’s Sloan School of Management, and Northwestern University’s Kellogg School of Management. Survey participants scored their schools across a variety of different criteria, and also described the programs in their own words. Despite driven classmates, respondents found their MBA programs to be highly collaborative, with nearly 80% of respondents ranking their programs more collaborative than competitive. Programs vary between campus-oriented and travel-focused cultures, with Kellogg ranking as the most campus-oriented and Harvard Business School as the most travel-focused. 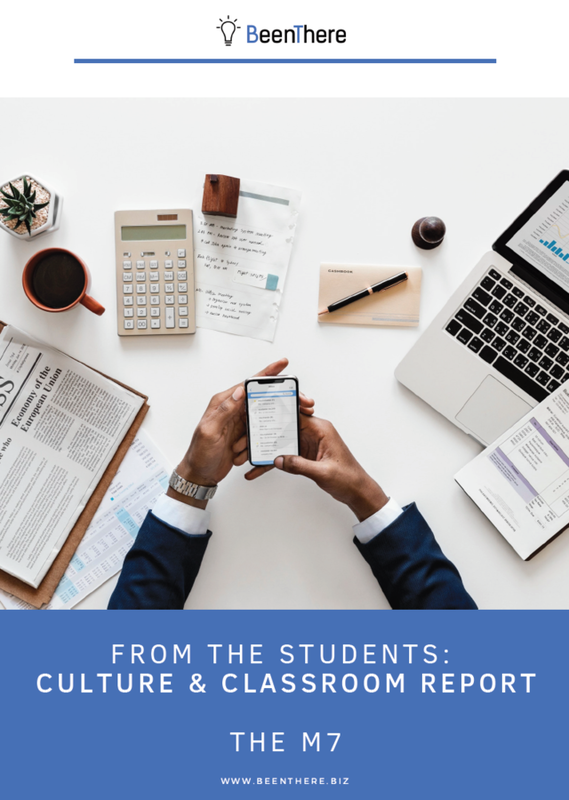 Despite 84% indicating a relatively low importance placed on grades, respondents concurred that programs’ curricula had high value (68% scoring their programs as high value). Despite broadly positive comments, 33% of respondents saw inclusiveness and cohesion as key areas for improvement, with desire for deeper relationships, less social segmentation, and less cliquey-ness. Visit https://www.beenthere.biz/mba-survey to learn more about students’ thoughts on their programs, including school-specific responses.